A trip to Bournemouth in the summer is simple. Beach, bargains, booze and breakfast – you can have the complete holiday experience in 24 hours without the hassle of leaving the country. But Winter is actually my favourite time of year for a long weekend by the sea. The town has an altogether classier vibe. And after a bracing walk on the beach and an assault on the shops, we have the perfect base for your full day of food, fun and frolics. 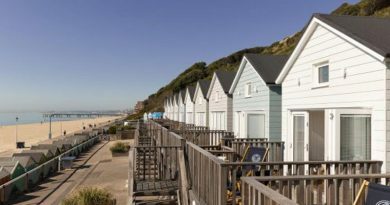 Known as Bournemouth’s Soho, the Poole Hill ‘Triangle’ district hosts some of the best bars, restaurants and coffee shops in the area. Even better, most are independents – no soulless chain bars or rowdy crowds. Here are our top six businesses to visit. Now open, Bournemouth centre’s only brewery will offer tours as well as offer a public bar. 20 types of locally brewed ales will be on offer and they expect to serve more than 15,000 pints a week, according to the local paper, the Bournemouth Echo. Will you be sipping on one of them? For food fuel by day, we recommend homemade soups and super sandwiches at Flirt, a perfectly quirky cafe that also sells bubble teas and healthy smoothies. Post-lunch, you can also enjoy a glass of wine. The all-you-can-eat breakfast buffet is also a favourite with groups. Now with outlets nationwide, Koh Thai started in Boscombe before opening a fantastic large restaurant on Poole Hill. The concept is fab. Yes, it’s tasty thai food but with tapas platters, it’s perfect for groups to share. Or opt for the £26 set menu and choose from a selection of stir fries, pad thais, curries and salads. Whether you like it hot or mild, there’s an option to suit all palates. Bournemouth’s only loft bar boasts cool cocktails, a classy crowd and frequent live music events featuring the likes of Craig Charles, as well as the finest local DJS and bands. We love Saturday nights, which are currently headlined by local legend Martyn T Hat. In a town where bars come and go frequently, Canvas is only getting more and more popular as it approaches its second birthday, so arrive early to beat the queues. Open from 7.30am daily, Espresso Kitchen is loved by tourists and locals alike to kick start their day. So rather than book that late-checkout, drag yourself out of bed and hit this chi chi cafe/takeaway so you can make the most of your last day in town. We recommend a double espresso first thing; then return for a lazy latte and a gossip post-shopping. Time for lunch before you go? We recommend Mad Cucumber – you don’t have to be vegan to fall in love with their homemade specials. Quiche, salads, curries and stroganoffs change daily but regular favourites of ours are the tomato and pesto pasta or the enchilada with rice and salad. Soups are served with gluten-free bread or rice cakes, so it’s perfect light bites to help you leave Bournemouth feeling refreshed. More information and menus for all the businesses are on Facebook. Hope to see you soon and don’t forget to tag @bournemouth247 and @LetsGoOut_BH in your Twitter and Instagram posts and photos! Editor in chief of bournemouthnews.info Suzi Dixon studied at Bournemouth university, went away for a while to work at The Daily Telegraph, then moved back to the sunny South coast for a quiet (er) life. Now, amongst other things, she guest writes for us at Lets Go Out! Eat healthy, feel amazing and get active at Taste of the South’s ZEN DEN! April 13, 2018 LGO Office Comments Off on Eat healthy, feel amazing and get active at Taste of the South’s ZEN DEN! July 31, 2018 LGO Office Comments Off on New menu launched at Key West Bar & Grill on Bournemouth Pier!